This week, we do three flicks suggested by and voted on by the listeners! First, two slacker friends spend all their time planning for an apocalypse when they're hit with reality in 2011's "Bellflower," directed by, written by and starring Evan Glodell. This flick was shot for a measly $17,000 and has a beautiful and unique look to it. Also, flame throwers and stuff. Next, Jennifer Connelly is a young girl who can telepathically speak to insects. Needless to say, she teams up with Donald Pleasence and a lazer-guided chimp to catch a serial killer in Dario Argento's 1985 flick "Phenomena," aka "Creepers." Finally, Indonesian director Arizal brings us a tale of justice, revenge, explosions and almost being Sylvester Stallone in 1986's "The Stabilizer," released in the US by Troma. 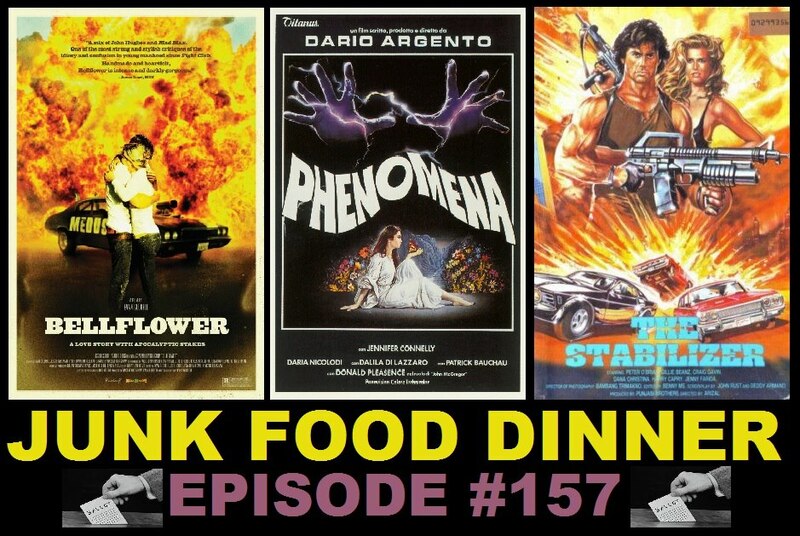 All this plus witty banter between friends, Nerd News, this week's DVD & blu-ray releases, brain damage as an accurate metaphor for a break up, complete confidentiality, no police involvement, the craziest deus machina ever, Donald Lloyd of the Junk Food Dinner Warehouse, Junk (voice)Mails, and so much more!